[We Are Not Marriott Oceana Palms TimeShare. -Rate includes 13% tax, internet, exit cleaning. is to smaller "Coast Line View" condo type. no refund if cancelled 24 hours after booking. -Sleeps 6. Add $40 per day for 6th person. -Free (5) in-condo beach chairs, umbrella, cooler, boogie boards. Marriott charges $30 a day 2 beach chairs-1 umbrella. -(1) Single Balcony 2 chairs-1 table. we have the only (5) of (7). Add $40 a day. "Standard Rate". Only (15) "Premium" condos. All 239 condos here are privately owned, not owned by Marriott. that runs the property, Marriott is only a marketing license. Eliminate the Marriott middleman costs. American Express Travel, and many airlines like JetBlue. Eliminate middleman costs of Priceline, also owns Booking.com, Kayak. They add 15-20% to all hotels' rates as commission. This is why hotel chains advertise 'book direct with us", and SouthWest is not on Expedia. -If $800 per night-Expedia profits $125 per night from you. -If $600 per night-Expedia profits $102 per night from you. -If $400 per night-Expedia profits $78 per night from you. Eliminate middleman costs of Expedia that owns VRBO, HomeAway. Eliminate middleman costs on TripAdvisor, Airbnb. They have created the past few years an insane scheme charging a "Booking Fee" to you the consumer $100-$700+, yet they own nothing. Spread out in our Family-Sized Condos vs. cramped hotel rooms. We 239 owners, pay for operating costs of the entire Resort. You have full use of all the Resort amenities and services. We are not time share, we own the condos 365 days of the year. Marriott manages most owner condos, marks-up the cost to the public. 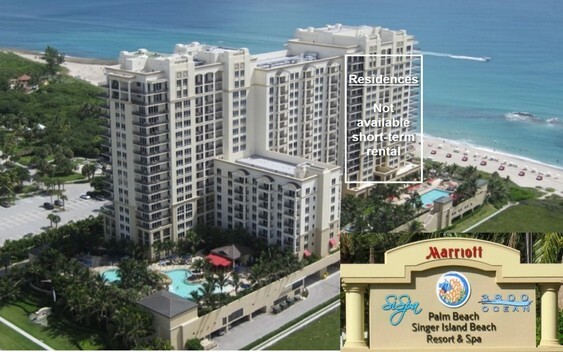 Oceanfront Residence condos are not available short term rental. 3-6 month minimum, lengthy background check, approval process. Housekeeping is extra/optional. Our housekeeping is former Marriott. Marriott provides pool and beach towels daily. Check In at Front Desk 24 hours. We have all the hook-ups for fun, activities, restaurants; see below. We live on Singer Island. playground, tennis courts, and Ocean Walk shops and restaurants. Airport, 50 minutes Ft. Lauderdale, 1.15 hour Miami, 2:15 Orlando. Perfect family, couples, small groups vacation value and fun! -Click "Resort Photos-Amenities" link on the left. Oceanfront Pool for adults: Elegant pool, Jacuzzi pool, cabana rentals. Lagoon Pool&Restaurant for families: Kids-fave waterslide, waterfall. babysitting, games,arts/crafts, Lagoon Pool "Movie Nights". -3800 Ocean Restaurant, North Palm Beach's only oceanfront restaurant. -Reef Tiki Bar & Beach Lounge: Kick it back a notch, have a drink, lite food. -Bonfire Beach Party's in winter. Smores & kids meets parent & cocktails. -SI SPA: Singer Island's only Spa, Conde Naste Traveler 2014 top 100 US. -24 Hour Front Desk Staff for checking in. -Concierge: For restaurants, reservations, water sports, golf, etc. -Limos/Airport: Full time on-property limo service. Sedan cars+SUV's. -Click "Thing To Do" link to the left. -10-20 minutes to many fun attractions and activities. -Snorkeling, scuba, surfing, wave runners, kayaks, fishing, parasailing. -Sport Fishing on our exclusive 50' Sport Fish Boat. See 'Fishing' link to left. World class sport fishing year 'round. US Sail Fish capital Dec-April. Lines in the water in 20 minutes. PGA National 5 courses we have exclusive T-Time Access in peak season when only PGA Resort guests or members play. Home of the Honda Classic Feb 19-25 2018 . North Palm Beach Country Club Public Course Jack Nicklaus "Signature". -SailFish Marina&Restaurant/Bar. Indoor/outdoor. Kids love feeding the fish! -Water Taxi at SailFish Marina. Private and small group trips around IntraCoastal Waterway, Palm Beach Island, Downtown West Palm Beach. Outdoor Stage with weekend family live music, IMAX, Dance+Music Clubs, Comedy Club, Kravitz Performing Arts Center. Hugo Boss, Sephora, Tommy Bahama, Apple Store, PF Chang's, Brio. Yard House, Cabo Flats, Ra Sushi, Sloan's Ice Cream, Cobb Movie Theater. -2014-new Palm Beach Designer Outlets. St. Louis Cardinals & Miami Marlins-Roger Dean Complex. -International Equestrian Center&Festival+Polo in Wellington. Jan-April. -Manatee Lagoon & Education Center: Brand new open Feb 2016. See Manatee's (sea cows) up close and learn about Florida's gentle giant. -Loggerhead Turtle Marine Life Center. Kids see and learn about sea turtles. -Lion Country Safari. Drive/walk thru, 900 animals. Feed giraffe's! -Rapid Water Park. 35 water rides. South Florida's only water park. -McArthur Beach State Park+Summer Camps. (top left of background photo). Palm Beach's only Beach State Park. 3-time Gold Medal National Beach Park. sea turtles, manatees, reefs, bird habitat. Summer Camps for kids. -Peanut Island Park & Snorkel Park. (bottom left background photo). Water Taxi at Sail Fish Marina ($10). Kayaks from visitpalmbeach.com (our beach concession operator). Beach it. Walk&jog path. Cookout at a gazebo (reserve), enjoy boats at Palm Beach Inlet. And, very famous weekend sandbar boat party! tennis courts, and our Ocean Mall shops&restaurants. Our Give your visitors a peek at the power behind your Web site by adding a link to Network Solutions®! Adding links to credible Web sites brings value to your own Web site and may raise your ranking on search engine results. You will be able to customize your Web site page names. Shorter URLs make it easy to remember. More search engine friendly Web addresses. What happens to people who have bookmarked my present URL/ Web site address? You will not lose any visitors if they use the old Web site address or if they type your page names incorrectly because they will be redirected automatically to your homepage. No action from you is required to set this up. If you are submitting specific page links to search engines or sending links to your customers you will use the new address for the page. Give your visitors a peek at the power behind your Web site by adding a link to Network Solutions®! Adding links to credible Web sites brings value to your own Web site and may raise your ranking on search engine results. Yes. Please add a Network Solutions link to my Web site! No Thanks. I do not want a Network Solutions link added to my Web site. Singer Island Marriott Resort vacation rentals (15) minutes from Palm Beach airport, (50) minutes from Ft. Lauderdale, (1.15) hours Miami, (2.2) hours from Orlando. Our Singer Island Marriott Resort vacation rentals (15) minutes from Palm Beach airport, (50) minutes from Ft. Lauderdale, (1.15) hours Miami, (2.2) hours from Orlando. -50" TV's (3). The only condos here with WiFi TV's; NetFlix, YouTube. Marriott rooms are 11 year old plasma tv's. -Bose Home Theater Sound System. -Free very high speed internet, unlimited devices. -In-condo 5-6 beach chairs, umbrella, cooler, boogie boards, beach toys.